‘Bajirao Mastani’ star Ranveer Singh won the 'Entertainer of the Year Award' at the NDTV Indian award ceremony. Ranveer received the award from none other than Jammu and Kashmir Chief Minister Farooq Abdullah. 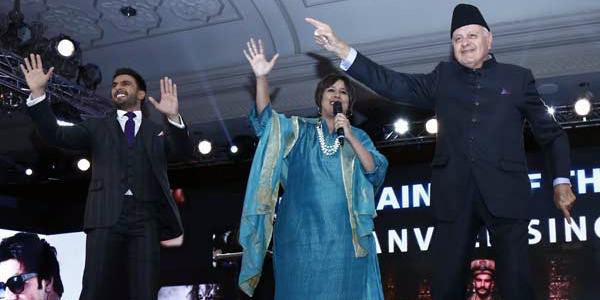 Ranveer who is called the energy bomb of B-Town proved his metal on the stage; he performed an impromptu jig with none other than Mr Abdullah. Ranveer later tweeted saying, "He (Farooq Abdullah) is too cool for school." Click on the pictures to see, Mr Farooq Abdullah shaking a leg with Ranveer Singh on the Malhari number from the movie 'Bajorao Mastani'. Ranveer performs amazingly but Farooq Abdullah was no less and was giving him some tough competition with his graceful movements! WOW!!! This was complete treat for the eye".Hearty congratulations to Ranveer Singh and also to Farooq Abdullah for their wonderful performance!